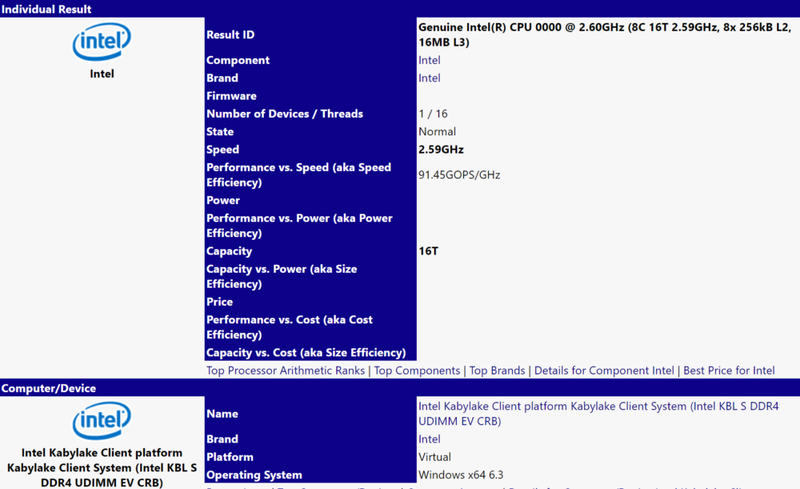 Intel’s rumored 8-core mainstream processor has made yet another appearance at SiSoft Sandra Database. Even though it says Kabylake, everyone knows that Coffeelake is basically Kabylake on steroids. The new processor has been tested on KBL S system (which stands for Kabylake S), it basically means we are looking at the same old LGA1151 platform. The page lists 2.6 GHz 8-core chip with HyperThreading enabled. That’s rather a disappointing frequency for a new gaming chip, but this is likely just a prototype or software error. Intel’s 8-core chip is expected to hit the stores soon, as the company has already revealed Z390 gaming chipset for new motherboards, which were supposedly designed with those processors in mind.